Want to reach an audience of art teachers across the state? 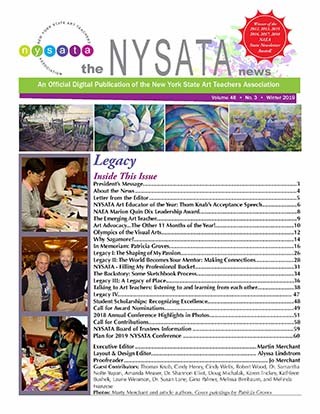 Advertise in the NYSATA News or on our website! NYSATA News has done it again! NYSATA has an Online Store! Go to nysata.promoshop.com to order hats, sweatshirts, polo shirts, and fleece vests with more items to be added. All items have the NYSATA logo embroidered on them. Easy to order, quick minimal cost delivery and if you have questions you can contact the store directly. NYSATA is working hard in collaboration with the other Arts Education Professional Associations to make recommendations to NYSED regarding revised Learning Standards for the Arts in New York State. If you have questions, please contact NYSATA Standards Revision Co-Chair Cindy Henry. 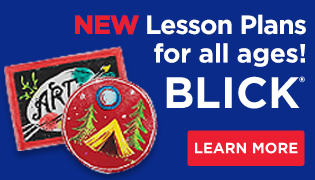 Visit our National Core Arts Standards Page. Submit an event by clicking here on Calendar of Events and using the SUBMIT AN EVENT link in the upper right corner of the calendar. Submitted events will be reviewed and added to the NYSATA calendar as appropriate. By voicing our concerns with regard to policies and legislation that effect art education. The New York State Art Teachers Association is made up of 10 Regions. Representatives from these regions, along with the elected officers, form the Board of Trustees which is the governing body of NYSATA. Members of NYSATA include representatives from pre-school through university level art educators, art administrators, museum educators, school administrators, school districts, commercial representatives, and friends and benefactors. Need to update your contact information? Use the blue tab at the top of this page to log in with your User ID and Password. Use the MY PROFILE link in the right column on the Member Welcome page to view and/or update your information. Still Having Trouble? Contact Website Coordinator Cindy Henry.